Ludwig II – Never envy the life of the rich and bored! In 1868, at age 18, Ludwig II became the king of Bavaria. But the times they were a-changing! He could never be an absolute ruler as he wished – instead he had to tread a very careful path around Bismark – a task for which he was apparently ill prepared. The result – a war that ended badly, and a rank of king only in name. But he had money – and nothing really to do. So he retreated into a life of fairy tales and Wagner inspired Grand gestures. Friendless at the end, but surrounded by servants – his cause of death in 1886 remains a mystery – although the ill minded might wonder about his uncle, who became regent upon Ludwig II death and ruled for quite some time. Sad life aside – Ludwig II wanted to build things – things that people would remember. And build he certainly did. We visited only 2 of his 8 palaces, one of which I’ll chat about today – the other tomorrow. 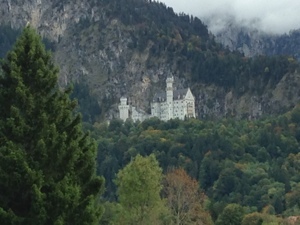 We also saw a third (Hohenschwangau) from a distance. That was more than enough to get the general idea- this was a king that loved the ornate, the over-the-top, the extreme. And he had the money to make it happen. 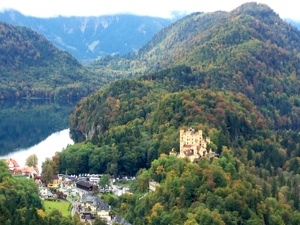 Neuschwanstein Castle is the stuff of picture books and Disney fairy tale fame. 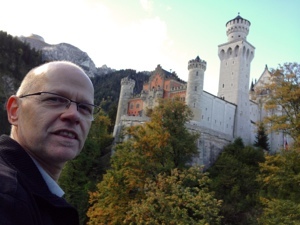 It’s not hard to imagine that Disney used Neuschwanstein as his model for Cinderella’s castle – even the guide books admit that this is one of the most famous buildings in the world. But Ludwig II only spent about 8 nights here – by all accounts he visited during the multi-year construction, but there were never any parties, any balls, any sparkling lights and magnificently dressed people – not in reality. But on the walls – Ludwig fished his wish. Heros of Wagner Operas are everywhere – proud, glorious, and for many – insane. The tour (it’s required that you take a tour – no self touring) needs to be reserved ahead – but if you are aware of that – the reservation is free, and the time you will save is counted in multiple hours. We walked in, walked up to the booth, paid and left. Others were less lucky – and dealt with snaky lines that looped and curled. Don’t do that – reserve your tour! Just a note – I don’t think you actually reserve a time – just a date. I’m not sure – but I typed in 11:00 as my desired time – and when we arrived – our tour ticket was 11:30. Not completely sure how that happened – I wasn’t the one who paid for the tickets. On the other hand – since we had 2 German speakers and 2 English speakers – they may have decided the only good choice was the tour with audio guides! 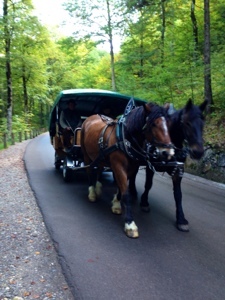 Anyway – cars are not allowed on the access road – only horse-drawn carriages and people walking. Shuttle buses take a completely different route. We thought we’d take the carriages – realized that the line was seriously long – and opted to walk. Good thing. No carriages passed us on the entire walk up. And it was a very easy walk, along a paved road through a forest. About 3/4 of the way up is the ‘carriage’ stop – and from there the views just get better and better. It’s a completely beautiful castle. No wonder it’s one of the top tourist spots in Germany. I get it. Totally get it! We had plenty of time to wander around the outside and take pictures – if the tour starts at 11:30 – it’s going to start at 11:30. This is Germany you know. There are normally so many tourists – they have a loading now – and a pre-loading line. And still the wait without reservations can be hours. Part of the reason – it’s not that horribly expensive. Combine relatively inexpensive with seriously famous and you have a winner. I carefully read the tripadvisor reviews before hand – and while the advice to get reservations is a winner – along with the advice to come early – the occasional complaint about the number of rooms you can see is completely unfounded. The issue isn’t the number of rooms you visit – it’s the number of rooms that were completed! And the rooms are huge. 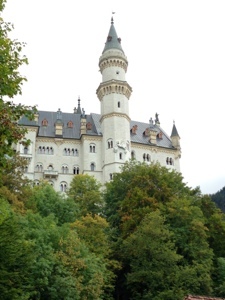 confiding that Ludwig was effectively hermit – it makes the castle even more amazing. Ludwig II had two floors completely done when he fled here in an attempt to escape the government representatives who were coming to put him in an insane asylum. But those 2 floors are wonderful. The life-size murals telling the legends that Wagner immortalized in his opera are simply stunning. The only sad thing is the speed that you must move thru in order to stay with your group. I actually ended up with the group after mine – caught between locked doors. No matter – that guide just waved a smile and continued on with their explanations. You are not allowed to take pictures inside (they want to sell those postcards) – but you can take pictures in the kitchen. 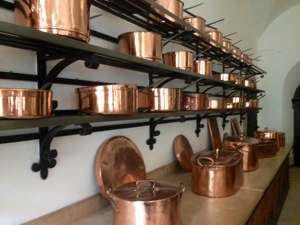 Got to love copper pans, eh? One of the best parts of the tour is one not often mentioned in the reviews. After you tour the castle, you end up at the restaurant. Decent prices, and standard German food awaits there. But across the hall is a stellar exhibit – a video subtitled in at least 3 languages that shows using animated sequences the history of the building of the castle. it shows the original medieval forts that determined the shape of the foundation, it showed the castle being built step by step – and most importantly it showed what was on the original plans, but never brought to fruition. Ludwig had planned on a Knight’s bath – effectively a private hot tub just for him. He’d also imagined a huge secondary terrace and overview on the Western side of the castle – the one overlooking his childhood home, the Schloss Hohenschwanagau. That’s the castle we saw from a distance, but never visited. After seeing the castle and watching the video, I was so impressed by the beauty of the paintings – not to mention the gold and gilt and ornamentation – I actually bought a story book that summarized the legends emblazoned on the walls. Bottom line – worth the trip!